Yesterday, FTVLive told you that Tegna is putting a $500 Holiday bonus is employees net paycheck. The fact that TV stations made millions and millions of dollars this year, all station groups should be sharing a bit of those profits with the employees. Sadly, it seems many groups, including Tribune will not be giving out bonuses this year. But, all is not lost. 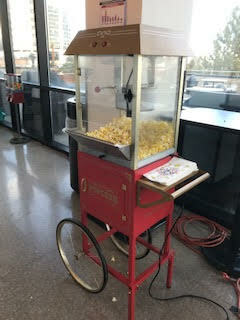 Yesterday at Tribune’s KVDR in Denver it was popcorn day. And here is the picture to prove it. BTW- If you are media company and after having a year like 2018 and you are not giving bonuses to your employees?